On this day, we chose to focus on the two types of zebras found in Lewa. 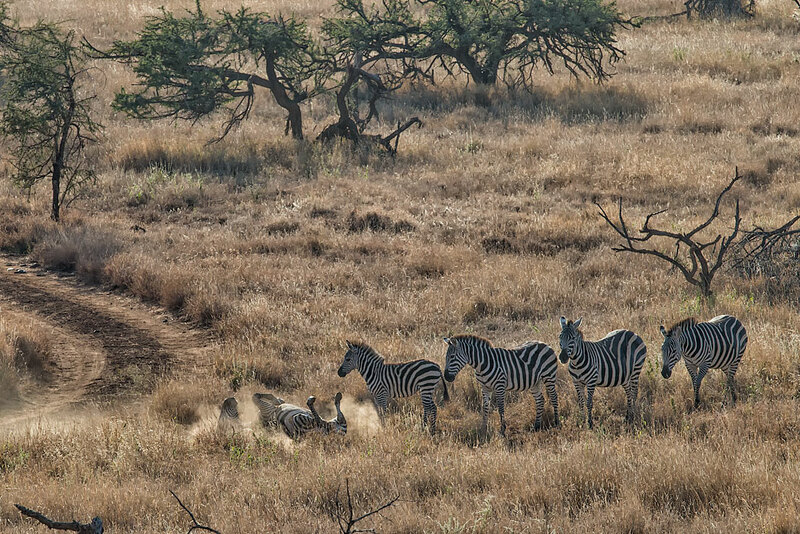 The most familiar is the common zebra but Lewa has a population of one of my favorite animals-the Grevy zebra. They are easily distinguishable from the common zebra by the size and shape of their over-sized ears and the white underbelly. 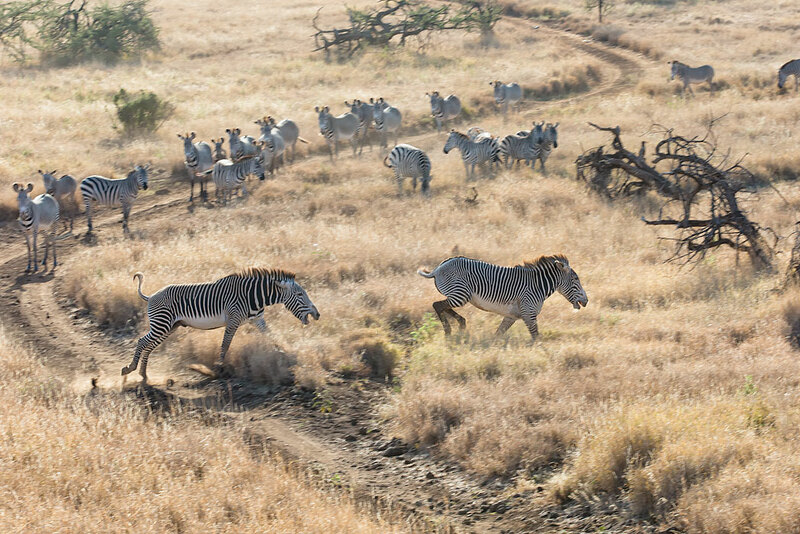 The two types of zebras can be found in a common group as we found just after sunrise. 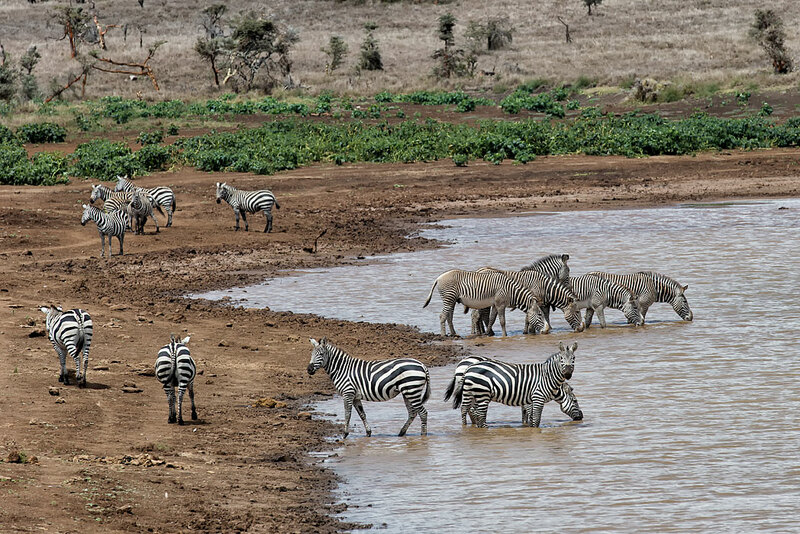 It is not uncommon to find large numbers of zebras following each other to water holes or other places. This morning, we saw about 100 zebras (mixed Grevy and Common) walking across a grass plain. A frequent behavior of zebras is to take turns rolling in the dust. 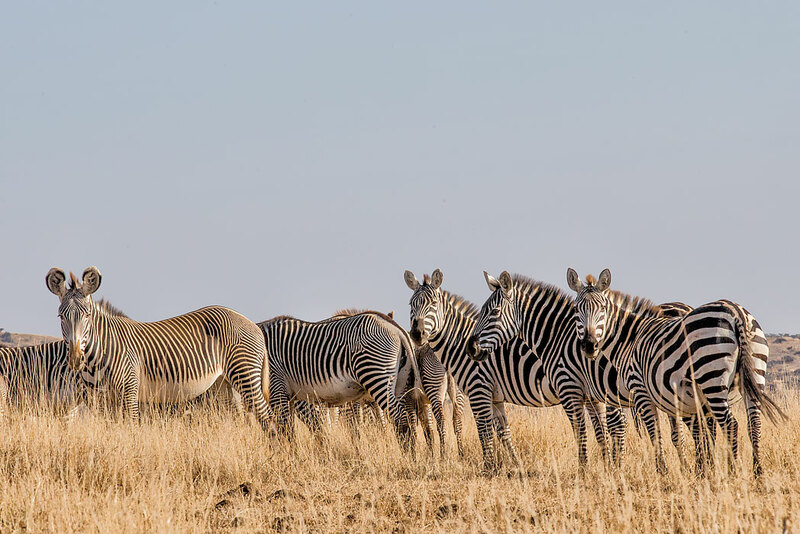 We sat and watched an endless number of zebras take turns and roll on their backs in the dust before continuing up the slight rise. Of course, when large numbers of anything get together, the inevitable challenge between males for dominance is a certainty. 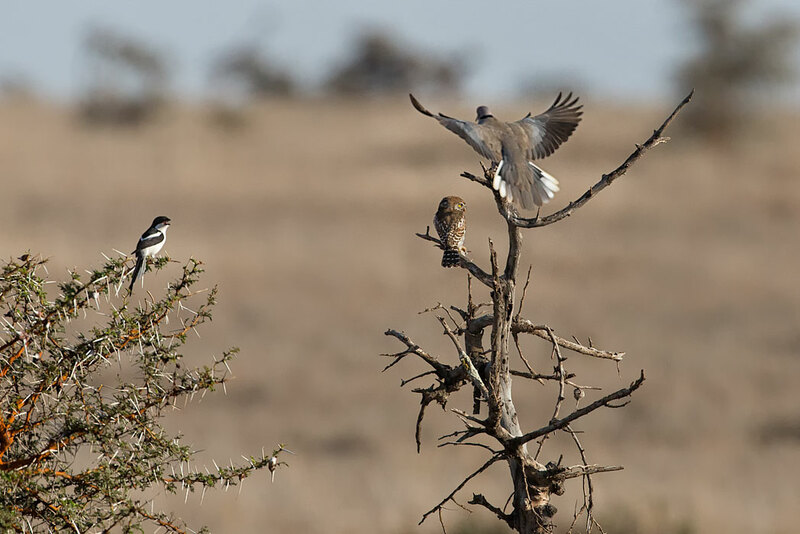 And on this morning there was no exception as we watched the dominant Grevy chase and nip at its challenger until the challenger was well over the horizon and left to lick its wounds and damaged ego. Challenges to be the dominant male in the herd are frequent and sometimes repelled with great fervor. 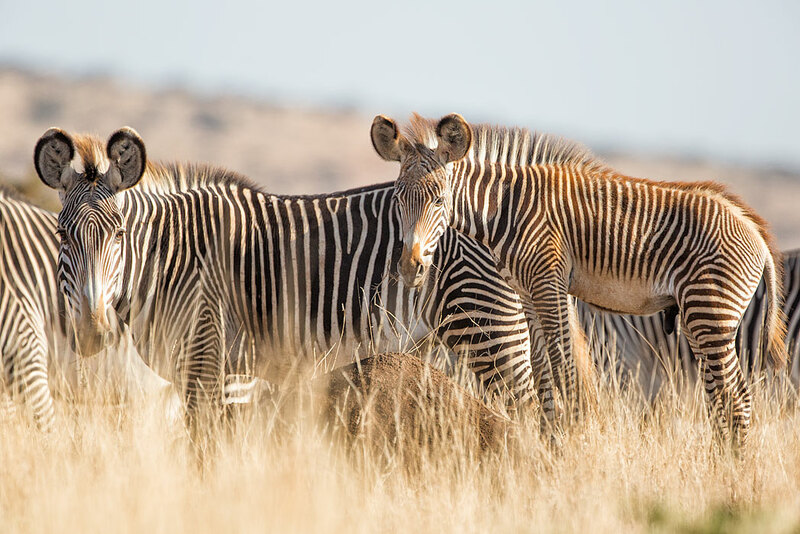 Zebras like virtually every animal we saw in Africa have strong maternal instincts. The Moms are diligent about protecting their foals and routinely position themselves between any threat and their young. Young zebras are targeted by the big cats but are no easy prey. Of course, crocs are notorious for going after young zebras but today at this waterhole, no crocs were present. 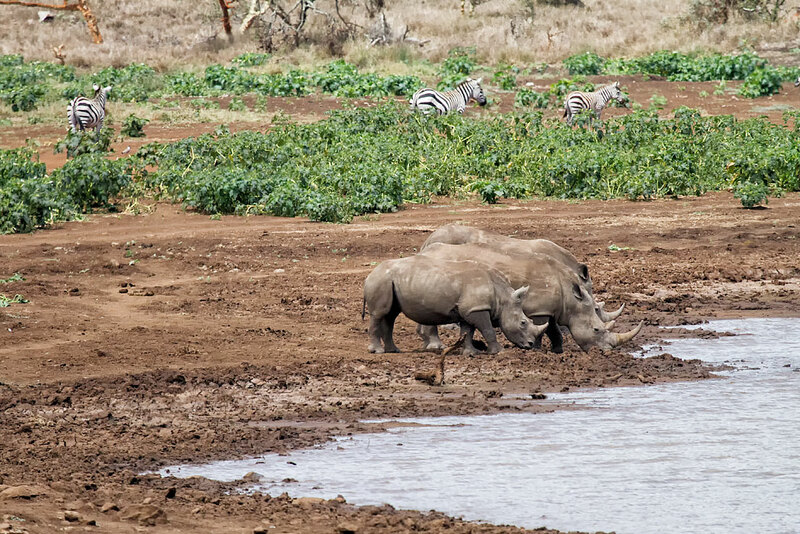 As soon as the zebras finished their drink, three rhinos appeared. Then a warthog and more all understanding the risk of predators laying in wait. Now the the light had become more harsh, we decided to head back to camp passing a herd of elephants that had been to the watering hole just prior to the zebras. We watched for a moment as they stripped bark from trees. Later this day, we decided to look for leopards that had avoided us so far at Lewa. This day was to be no different but along the way we spotted an unusual colored Reticulated giraffe. Seems this giraffe had more white pigment than others and clearly stood out. We wondered how such a giraffe could survive given the coloration that reduced its ability to camouflage itself from predators. 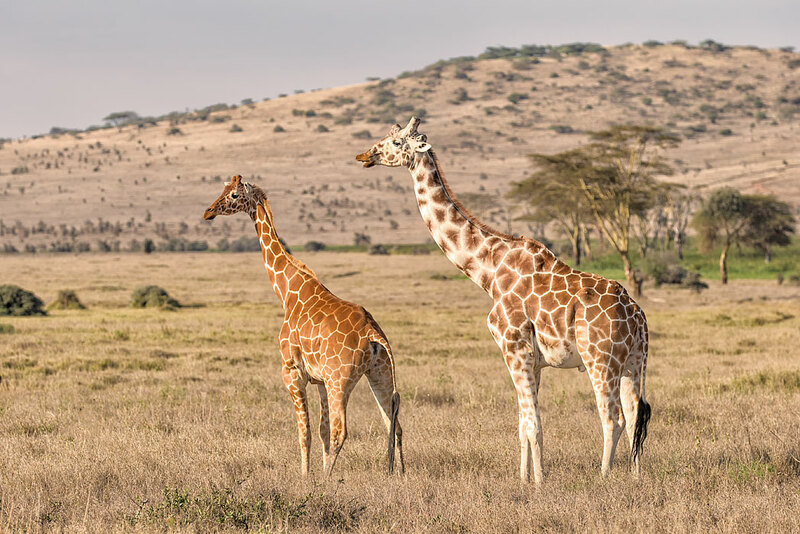 But giraffes often travel in groups and their vantage point, eyesight and lethal kicks serve them well-as we would see first hand later in the day. 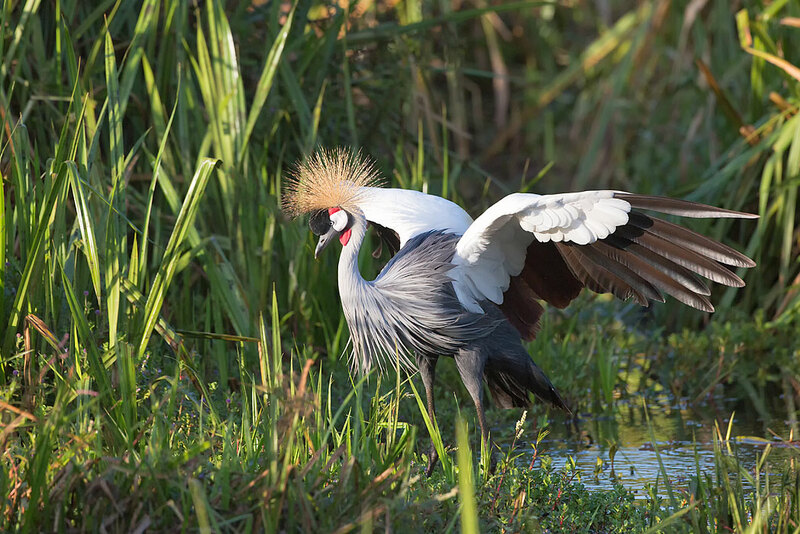 After watching for awhile, we stopped by the marsh and found African crowned cranes lit up by the sun. As we watched, we could hear the sound of baboons nearby. We drove into the small woodland. The light was not right for photographing as the shade was dense and the light was from the wrong direction. Nevertheless, we were delighted as the the large group of baboons played with their young. 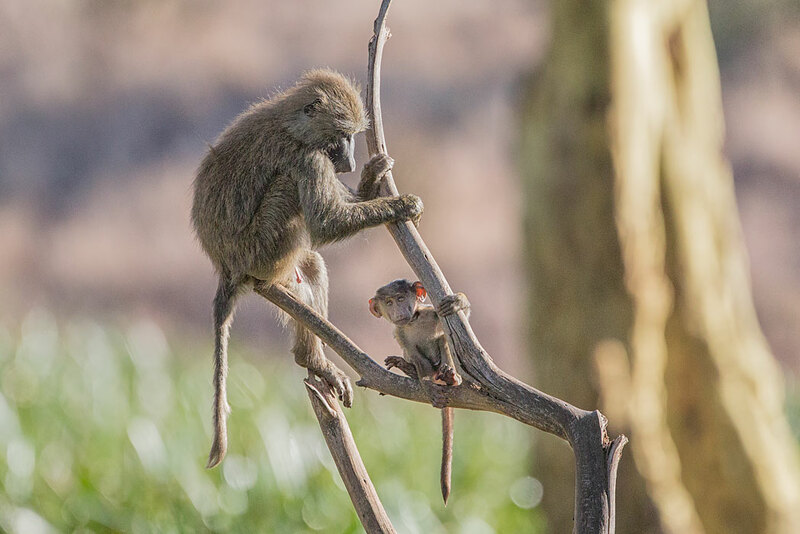 Large numbers of baboons and their babies entertained us while we took a break from the sun. Now as the sun was beginning to set, it was time to head for home. Despite not finding the leopards, it had been a glorious day. Little did we know, that one more surprise was still to come. jAs we celebrate another wonderful day in the bush and feeling that our souls have been nurtured, we reflect back on one special sighting of the day. It was not the biggest or fastest animal. In fact it was the smallest that Joseph miraculously spotted as were driving around. It was a pearl spotted owlet-a bird no larger than my fist. Our time at Lewa will end soon as we move onto the Northern Mara Conservancy and Serian Ngare tomorrow. But our memories will live on. And there is always the game drive to the airstrip, right? This is bringing back wonderful memories of trips to Lewa, but I don’t think I was ever this fortunate with sightings. Love the Grevy study, my favourite zebras. Really enjoying your writing and looking forward to more. Outstanding photos, the zebs are awesome!